The artists below piece together a variety of materials to execute their conceptual ideas. 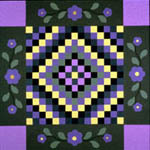 The works are not quilts; they are not made for use. 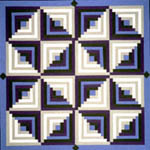 However, the quilt as an historical precedent creates a familiar point of reference. 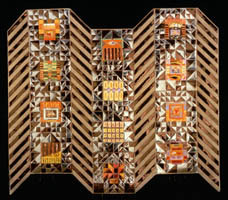 As contemporary two and three-dimensional works, these architectural, abstract or figurative images merge into the less easily defined field of visual art. 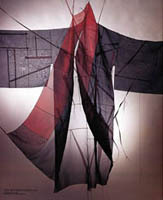 The complexity of surface in Patricia Malarcher's pieced constructions mirrors the bricolage of contemporary culture. 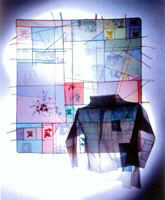 Her work combines traditional textile elements, light reflective mylar and color into architectural illusions. 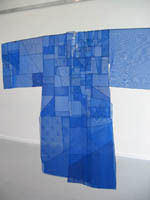 Pojagi---traditional Korean wrapping cloth---inspires the work of Chunghie Lee. Ethereal and beautiful, her work creates a living testament to anonymous female ancestors. 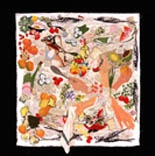 Intuitive and spontaneous, Ai Kijima paints with fabric. Her explosive use of color references abstract expressionism while her imagery evokes "the absurd mystery" of the universe. 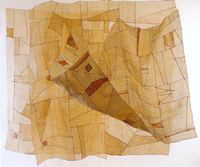 Karen Moskowitz reinterprets traditional quilt designs in paper. 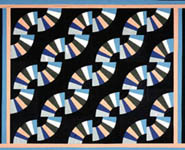 Her formal color studies and repetitive patterns create eye-dazzling effects. 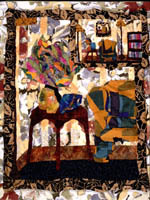 Maxine Farkas uses fabric collage in an illustrative way. With humor and irony she comments on social politics and snippets of everyday life. Our show brings together internationally acclaimed artists who explore the use of "piecing" as an art form. We encourage your comments. 24" x 36" (in Plexiglas box), each unit 9" x 9"
53" x 30" x 4"
Cotton, rayon, silk, trapunto, hand applique, machine pieced, hand quilted. Mounted. Vintage table linen, paper, acrylic paint, machine appliqued and quilted. Cotton, silk, linen, rayon. Machine pieced, appliqued, quilted. WHO LET THOSE DOGS IN MY GARDEN?